Renowned Mozart scholar Daniel Heartz brings his deep knowledge of social history, theater, and art to a study of the last and great decade of Mozart's operas. Mozart specialists will recognize some of Heartz's best-known essays here; but six pieces are new for the collection, and others have been revised and updated with little-known documents on the librettist's, composer's, and stage director's craft. All lovers of opera will value the elegance and wit of Professor Heartz's writing, enhanced by thirty-seven illustrations, many from his private collection. The volume includes Heartz's classic essay on Idomeneo (1781), the work that continued to inspire and sustain Mozart through his next, and final, six operas. 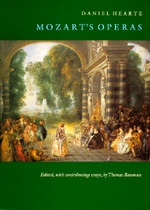 Thomas Bauman brings his special expertise to a discussion of Die Entführung aus dem Serail (1782). The ten central chapters are devoted to the three great operas composed to librettos by Lorenzo da Ponte—Le nozze di Figaro (l786), Don Giovanni (l787), and Così fan tutte (l790). The reader is treated to fresh insights on da Ponte's role as Mozart's astute and stage-wise collaborator, on the singers whose gifts helped shape each opera, and on the musical connections among the three works. Parallels are drawn with some of the greatest creative artists in other fields, such as Molière, Watteau, and Fragonard. The world of the dance, one of Heartz's specialties, lends an illuminating perspective as well. Finally, the essays discuss the deep spirituality of Mozart's last two operas, Die Zauberflöte and La Clemenza di Tito (both l79l). They also address the pertinence of opera outside Vienna at the end of the century, the fortunes and aspirations of Freemasonry in Austria, and the relation of Mozart's overtures to the dramaturgy of the operas. Daniel Heartz is Professor of Music at the University of California, Berkeley. Thomas Bauman is Professor of Music at the University of Washington, Seattle.